Enjoy our collection of coin pendants, chains, cuff links, rings adorned with American Eagle coins, Chinese panda coins, gold buffalos and St. Gaudens double eagles. 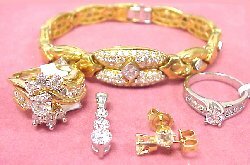 We offer jewelry repair in our store too. CHECK OUT LATEST STYLES OF GOLD COIN JEWELRY! DISCOVER THE BEAUTY OF AMERICAN EAGLE GOLD COIN JEWELRY!. 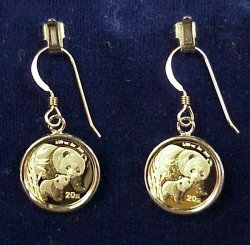 . . WE HAVE ALL SIZES AND DENOMINATIONS OF THE AMERICAN EAGLE AND CHINA PANDA GOLD COIN JEWELRY IN STOCK NOW! . . . DISCOVER HOW TO INVEST IN BEAUTIFUL WEARABLE LIQUID ASSETS FROM MJPM! Wear and enjoy your gold! 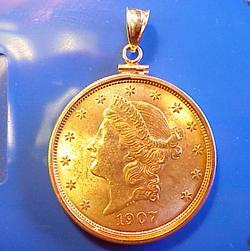 Our gold coin jewelry prices are updated weekly and daily if the gold market is extremely active. You can always count on the BEST PRICE from MJPM! Dont be fooled by a competitors ridiculous low prices. . . there is no substitute for quality and authenticity. . .buy with confidence from the people who know gold coin jewelry. . .MJPM! CHECK OUT THE NEW DESIGNS FOR THE CHINA PANDA BEAR GOLD COIN!. . . WE HAVE MOST SIZES IN STOCK! Each coin is struck in .9999 fine gold and come in the following sizes: 1/10 oz., 1/4 oz., 1/2 oz., and 1 oz. sizes! 1/10 oz. American Eagle Gold Coin Pendant! 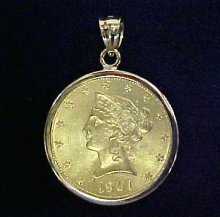 Top Seller!...the 1/10 oz American Gold Eagle Coin Pendant w/14k Plain Style Frame!...You will receive a beautiful 1/10 oz. American Eagle gold coin (about the size of a U.S. dime) in perfect GEM uncirculated condition. Comes to you mounted in our solid 14k gold plain frame and is ready to wear! This coin is $5.00 U.S. Legal Tender too!. . .Please scroll on...we have all sizes in stock! 1/4 oz. American Eagle Gold Coin Pendant! 1/4 oz. 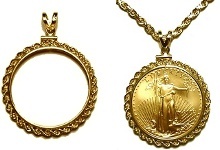 American Gold Eagle Coin Pendant w/ 14k Plain Style Frame...Every coin (is just a bit larger than the U.S. Nickel) will come to you in beautiful brilliant uncirculated condition and will be custom mounted in our finest quality 14k gold frame ready to be worn and enjoyed, and the coin is $10.00 U.S. Legal Tender too! We have the new .9999 gold Buffalo Pendant! 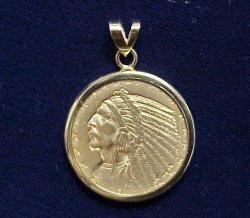 We have the American Buffalo Gold Coin Pendant... The beautiful $50 U.S. Buffalo .9999 fine gold coin was first minted in 2006 and has become a best seller! Every coin is in perfect gem brilliant uncirculated condition and will come to you custom mounted in our best solid 14kt gold plain style tab back coin bezel and ready to wear! 1/10 oz. American Eagle Rope Pendant! 1/10 oz. 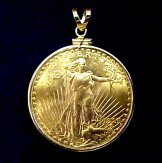 American Gold Eagle Coin Pendant w/ 14k Rope Frame...Every gold eagle coin pendant will come to you in beautiful brilliant uncirculated condition! Carefully custom mounted in our best solid 14k yellow gold rope bezel and is ready to wear and enjoy! This coin is $5.00 U.S. Legal Tender too! Top Seller! 1/4 oz. Gold Coin & Rope Pendant! 1/4 oz. American Gold Eagle Coin Pendant w/ 14k Rope frame...The 1/4oz. American Gold Eagle coin pendant is one of our most popular sellers. The 1/4 oz. (U.S. $10 Legal Tender) is just a little larger than the U.S. Nickel and contains 1/4 oz. of native American gold. Each coin is selected from a fresh U.S. Treasury roll for its beautiful brilliant uncirculated condition and mounted in our best quality 14k gold rope bezel! Other sizes and variations are available. . .please scroll on! $20 St. Gaudens Gold Coin Plain Style! An American Classic and BUYERS CHOICE! 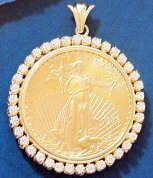 . . .the $20 U.S. St. Gaudens Gold Double Eagle Coin Pendant... The St. Gaudens $20 gold coin was minted from 1907 until 1933 and is one of our best sellers! Each coin is in original brilliant uncirculated condition and will come to you (date of our choice) custom mounted in our best solid 14k gold plain style coin bezel and ready to wear! GET A ROPE! 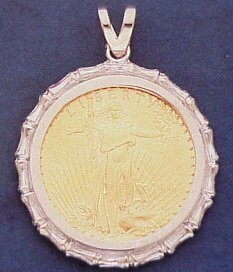 A $20 U.S. St. Gaudens Gold Double Eagle Coin Pendant...The St. Gaudens $20 gold coin was minted from 1907 until 1933 and is a best seller here at MJPM! Each coin is in original brilliant uncirculated condition and will come to you (date of our choice) custom mounted in our best solid 14k gold rope bezel and ready to wear! Popular 1oz. American Eagle Coin Pendant! ONE OF OUR BEST SELLERS! 1oz. American Gold Eagle Pendant...This is the beautiful 1oz. American gold eagle coin in lovely brilliant uncirculated condition...the 1oz. ($50 legal tender/about the size of a half dollar) gold eagle comes mounted in our solid 14k gold plain style bezel and ready to wear! Beautiful 1oz. American Gold Eagle Pendant... 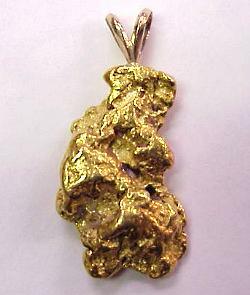 The American Gold Eagle pendants have been a popular seller. The 1oz. American gold eagle contains 1 oz. of fine gold and has the symbolic denomination/face value of $50 dollars. Your coin is fresh from the U.S. Treasury and is in brilliant uncirculated condition. Comes mounted in our best solid gold 14k rope bezel and ready to wear! 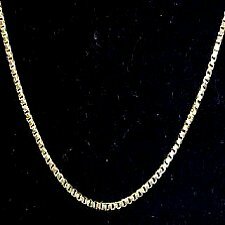 Try our Handmade 14k Italian Gold Box Chain! 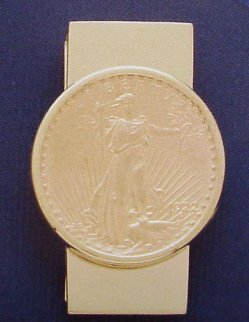 A BEST SELLER!...Our solid 14k gold $20 St. Gaudens gold double eagle money clip... This is for the one who has almost everything! 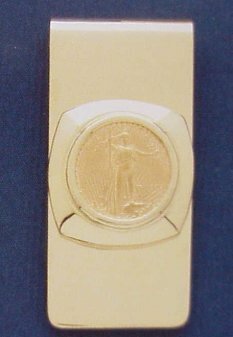 Our 14k gold money clips are made as a perfect fit for the U.S. $20 St. Gaudens Gold Double Eagle! We use our heaviest (the clip weighs 46 grams) and ultra secure full rim coin bezel to provide years of safe use. We also have spring clip styles available please call for details. Shop and compare...these are the best! Our solid 14k gold ***nugget style*** $20 St. Gaudens gold double eagle money clip... Here is another great idea for the one who has almost everything! Our solid 14k gold Nugget style money clips are made as a perfect fit for the U.S. $20 St. Gaudens Gold Double Eagle! We use our heaviest (the clip weighs 50 grams) and ultra secure full rim coin bezel to provide years of safe use. We also have spring clip styles available please call for details. Shop and compare...these are the best! SAVE A LOT AT MJPM.COM! American Gold Eagle Cuff links with 1/10 oz. 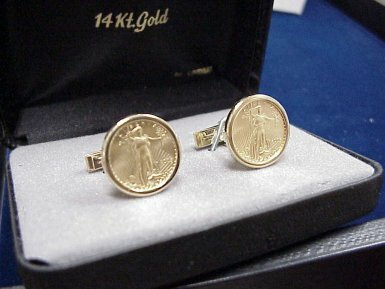 gold coins!...Get him these solid 14k gold cuff links! Each Cuff link comes with a new gem brilliant uncirculated 1/10 oz. American Gold Eagle coin securely mounted and ready to wear! American Gold Eagle Cuff links with 1/4 oz. gold coins!...Each Cuff link comes with a new gem brilliant uncirculated 1/4 oz. American Gold Eagle coin securely mounted and ready to wear! 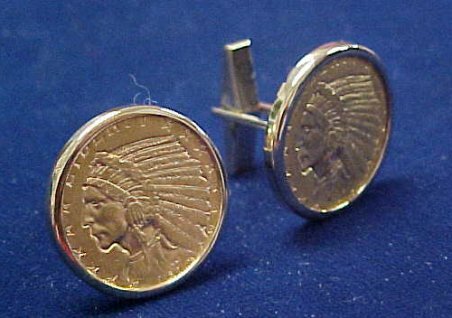 Check out these genuine Old West Gold Coin Cuff links!...Each Cuff link is made of SOLID 14k yellow gold and is assembled using a Collectors quality Very Choice Almost brilliant uncirculated U.S. $5.00 dollar Indian head Gold Coin (ALSO AVAILABLE in the U.S. $2-1/2 size) securely mounted and ready to wear! 1/10 oz. 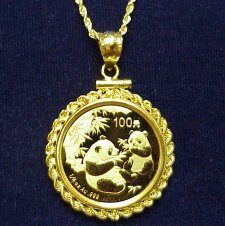 China Panda Gold Coin Pendant! 1/10 oz. 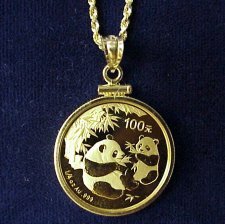 China Panda Coin Pendant w/14k Plain Bezel...This issue is proving to be one of the most popular Panda Bear designs to date! The 1/10 oz. is about the size of a U.S. penny. Your gem brilliant uncirculated coin comes mounted in our lovely solid 14k plain style gold coin frame ready to be worn and enjoyed! 1/10 oz. China Panda & Rope Pendant! 1/10 oz. 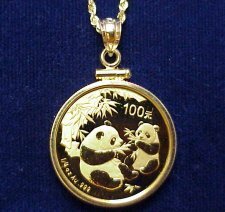 China Panda Coin Pendant w/14k Rope Bezel...One of our best sellers! 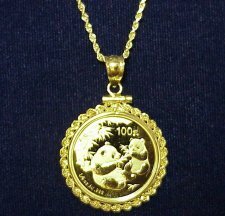 Your gem brilliant uncirculated Panda Bear gold coin will come mounted in our best quality 14k gold rope bezel and ready to wear! 1/4 oz. 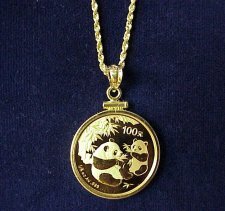 China Panda Gold Coin Pendant! 1/4 oz. 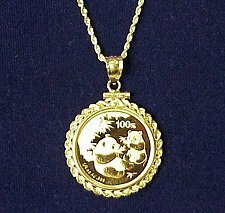 China Panda Coin Pendant w/ 14k Plain Bezel...Your beautiful .9999 pure gold China Panda Bear gold coin is about the size of the U.S. nickel. Your coin will come to you in gem brilliant uncirculated condition and mounted in our solid 14k gold bezel ready to be worn and enjoyed! 1/4 oz. China Panda & Rope Pendant! 1/4 oz. China Panda Coin Pendant w/ 14k Rope Bezel...Without a doubt this is becoming the most popular Panda Bear designs to date! These have been a real hit and we have a limited supply of the 1/4 oz. coins left to sell at our ridiculously low selling price. Each gem brilliant uncirculated coin comes mounted in our best quality 14k gold rope bezel and ready to wear! BEST SELLER! 1/2 oz. American Gold Eagle Coin Pendant w/ 14k Plain frame...The half ounce American Eagle is a bit larger than the U.S. quarter and is one of our popular sellers! Your beautiful American eagle coin pendant will be delivered to you mounted in our best quality MJPM 14k gold coin bezel, ready to be worn and enjoyed! This coin is $25.00 U.S. Legal Tender too! $25.00 U.S. Legal Tender American Eagle gold coin!. . . Beautiful 1/2 oz. 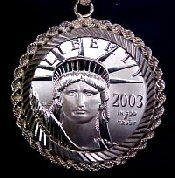 American Gold Eagle Coin Pendant w/ 14k Rope frame. . .The American Gold Eagle pendants have been popular sellers. Check out this 1/2 oz. (U.S. $25 Legal Tender) version and contains 1/2 oz. of native U.S. gold. Each pendant is fresh from the U.S.Treasury in brilliant uncirculated condition and mounted in our best quality 14k rope bezel ready to wear! Other sizes and variations are available. . .please scroll on! 1/2 oz. China Panda Coin Pendant! 1/2 oz. 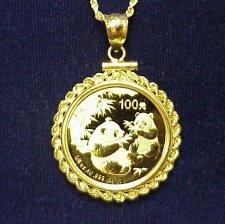 China Panda Coin Pendant w/ 14k Plain Bezel...This issue is proving to be one of the most popular China Panda Bear designs to date! For size reference, the 1/2 oz. coin is a bit larger than the U.S. quarter. Each gem brilliant uncirculated coin is carefully removed from its Mint plastic cover and set in our solid 14k yellow gold coin bezel and ready to wear! INTERNET BEST PRICE! 1/2 oz. Panda Bear! 1/2 oz. China Panda Coin Pendant w/ 14k Rope Bezel... This issue is one of the most popular Panda Bear designs to date! The 1/2 oz. coin comes mounted in our best quality 14k yellow gold rope bezel and will be ready to wear! 1oz. American Eagle Gold Coin Pendant! BUYERS CHOICE! 1oz. 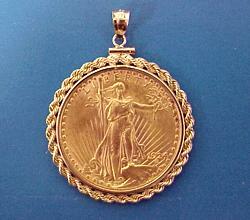 American Gold Eagle Coin Pendant w/ 14k Plain Frame...This is the beautiful 1oz. American gold eagle coin ($50 U.S. Legal Tender) in gem brilliant uncirculated condition! This beauty comes mounted in our solid 14k gold frame and is ready to wear! Beautiful 1oz. 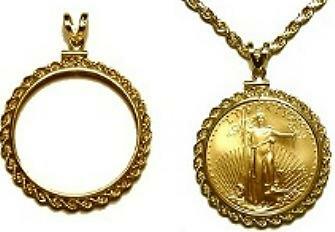 American Gold Eagle Coin Pendant w/ 14k Rope Frame. . .The American Gold Eagle pendants have been a popular seller. The 1oz. American gold eagle contains 1 oz. of gold and is $50 dollars U.S. Legal Tender. Your coin is fresh from the U.S. Treasury and is in brilliant uncirculated condition. Comes mounted in our best solid gold 14k rope frame and ready to wear! 1oz. 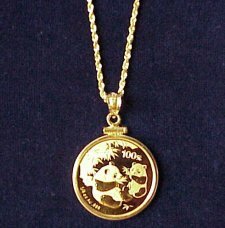 China Panda Gold Coin Pendant! 1oz. China Panda & Rope Pendant! 1 oz. China Panda Coin Pendant w/ Rope Bezel... This issue is one of the best Panda Bear designs to date! The .9999 fine gold 1oz. coin will come to you in gem brilliant uncirculated condition and mounted in our best quality solid 14k yellow gold rope bezel ready to wear...perfect! Timeless $20 Liberty Gold Coin Pendant! Popular $20 U.S. Liberty Head Gold Double Eagle Pendant Each coin is in beautiful brilliant uncirculated condition and mounted in our solid 14k gold bezel ready to wear and enjoy! Our Classic $20 U.S. Liberty Head Gold Double Eagle Pendant... Each coin has been individually selected by our staff coin expert for brilliance and beauty. Your coin will arrive in uncirculated condition and mounted in our best solid 14k gold rope bezel ready to wear and enjoy! 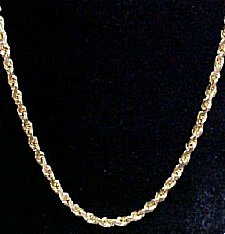 Try our Handmade 14k Italian Gold Rope Chain! 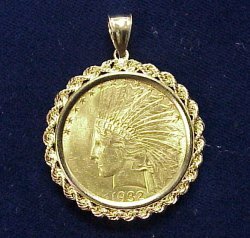 HOT SELLER!...Classic U.S. $10 Indian Head Gold Eagle coin pendant in brilliant uncirculated condition (date of our choice) and will arrive at your destination custom mounted in our best solid 14k yellow gold bezel and ready to wear! THESE ARE ABSOLUTELY STUNNING!! !...Your U.S. $10 Indian Head Gold Coin will come to you in lovely brilliant uncirculated condition! It will be securely mounted in our solid 14k gold rope coin frame and come to your ready to wear! 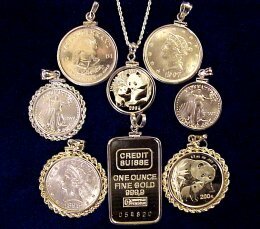 Scroll on to see our other exciting U.S. Gold Coin Jewelry in stock now for same day shipping! U.S. $10 Gold Coin Plain Frame! Wear Some Terrific Old West History with this $10 U.S. Liberty Head Gold Eagle Coin... 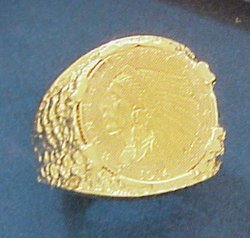 The early gold eagles of America were minted from 1839 until 1907 when the new Indian head design was enacted by Congress. Each coin is in brilliant uncirculated condition and comes mounted in our best solid weight 14k gold bezel and ready to wear! An American Old West Classic...The $10 U.S. Liberty Head Gold Eagle coin offers a BIG look at a great price! Each coin is guaranteed for its authenticity and will come to you in brilliant uncirculated condition and mounted in our solid 14k gold rope bezel ready to wear and enjoy! MJPM. . .The BEST PRICE & QUALITY everytime! 1/10 oz. 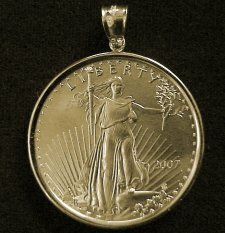 Platinum American Eagle Pendant...Each coin comes mounted in our best quality PLATINUM rope coin frame. Other coin weights available upon request---please call! Top Seller! 1/4 oz. Platinum Pendant! 1/4 oz. 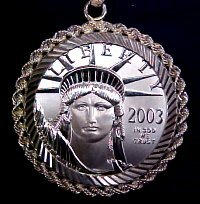 Platinum American Eagle Pendant...Each coin comes mounted in our best quality PLATINUM rope coin frame. Other coin weights available upon request---please call! Stunning pure 999.9 fine 1 oz. (24kt.) 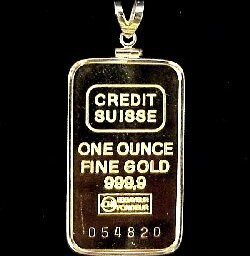 Credit Suisse gold bar... We like to call this awesome pendant the ***international look! *** Each gold bar comes with its registered serial numbered certificate of authenticity and purity. You will be delighted with the quality and **feel** one experiences wearing this lovely bar of gold! Each gold bar will come to you mounted in our popular solid 14k yellow gold bezel and ready to wear! Bamboo Style American Gold Eagle Pendant! 1/2 oz. American Eagle gold coin in Bamboo!...The Bamboo look is HOT! Especially when it comes with a brand new 1/2 oz. American Gold Eagle in brilliant uncirculated condition! Made with our best grade 14k gold and finished to a high luster. Available in 14k white or yellow gold! Buy the Best! 1 oz. Eagle & Diamond Pendant! Diamond & American Eagle Gold Coin Pendant... Check this one out! We have taken the 1 oz. 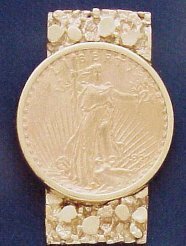 American Gold Eagle coin and mounted it with our best quality 1.0 carat fine diamond bezel made of solid 14k gold and its ready to wear! Be sure to visit Diamondshere.com for more selections!...Diamondshere Jewelry Dept. for more terrific fine jewelry. We have a large selection of fine gems, bracelets, pearls, earrings, pendants, engagements rings and wedding sets. The perfect size and look! 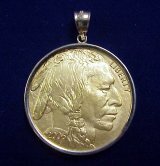 U.S. $5 Indian Head Half Eagle Gold Coin w/ 14k Plain Bezel...This is the popular incuse design that provides a terrific look! Your coin will come to you in brilliant uncirculated condition (date of our choice)! 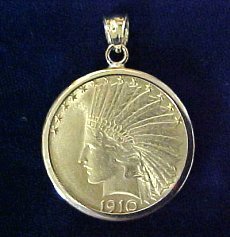 This historic beauty (about the size of the nickel) comes mounted in our solid 14k gold plain style bezel ready to wear! 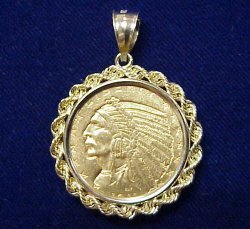 U.S. $5 Indian Head Half Eagle Gold Coin Pendant w/ 14k Rope Bezel... This timeless classic will arrive to you in brilliant uncirculated condition. Each coin comes mounted in our solid 14k yellow gold diamond cut rope style bezel ready to wear! 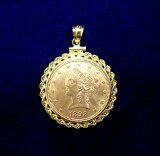 U.S. $5 Liberty Head Half Eagle Gold Coin Pendant w/ 14k Plain Bezel... A beautiful early authentic gold coin in brilliant uncirculated condition (dates of our choice) and wonderfully mounted in our solid 14k gold plain style bezel ready to wear and enjoy! 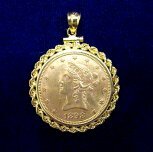 U.S. $5 Liberty Head Half Eagle Gold Coin Pendant w/ 14k Rope Bezel... A beautiful early authentic gold coin in brilliant uncirculated condition (date of our choice) and wonderfully mounted in our solid 14k gold rope style bezel ready to wear and enjoy! The Popular U.S. $2-1/2 Liberty Head Quarter Eagle Gold Coin Pendant w/ 14k Plain Bezel... Each coin (about the size of a dime) will come to you in lovely brilliant uncirculated condition and custom mounted in our solid 14k gold plain style coin bezel! You will love it! 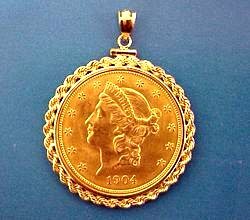 U.S. $2-1/2 Liberty Head Quarter Eagle Gold Coin Pendant w/ 14k Rope Bezel...Each coin will come to you in lovely brilliant uncirculated condition and custom mounted in our solid 14k gold rope bezel! You will love it! A GREAT GIFT! 1/10 oz. 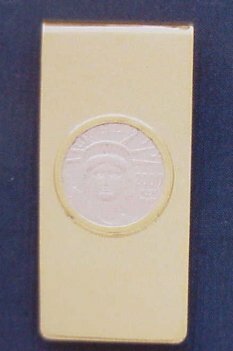 American Eagle Gold Coin & 14k Gold Money Clip!...We have taken a gem brilliant uncirculated 1/10 oz. 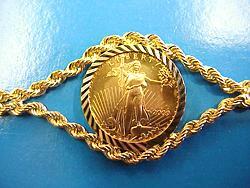 American Eagle gold coin and mounted it in our finest and heaviest weight 14kt clip! Its your choice of 14kt white or yellow gold! Other coin sizes are available...please call! LIMITED AVAILABILITY OFFER!...AUSTRIAN PHILHARMONIC 1/10 oz. Gold Coin Pendant!... You can be the unique one among your friends with this SCARCE & BEAUTIFUL 1/10 oz. 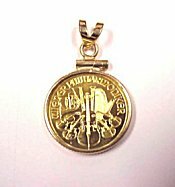 .9999 pure PHILHARMONIC gold coin pendant from AUSTRIA in GEM uncirculated condition. Every gold coin pendant purchased from MJPM will come to you mounted in our solid 14k gold bezel and is ready to wear! LIMITED TO STOCK ON HAND! Platinum has been red hot...and so are these money clips! Your choice of either the 1/10 oz. or 1/4 oz. American Platinum Eagle. Comes mounted in our ultra secure 14k gold hinge style clip and ready to use. Popular China Panda Bear .9999 pure gold coins... mounted in our best weight 14kt gold drop style earrings. 2004 pictured - please check for available dates. These come in both the 1/20 oz. or 1/10 oz. coin sizes. 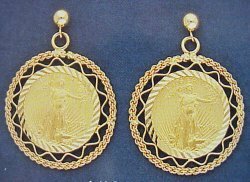 1/10th oz American Gold Eagle & Wire Earrings These fashionable rope and wire earrings are ready to wear (also available in the 1/10 oz. size). Each is made using a genuine U.S. $2-1/2 Indian gold coin minted from 1908 - 1929 and selected for its premium quality and comes mounted in our custom ring made of solid 14kt gold and ready to wear! (call for date availability)! Adorable 1/10 oz. 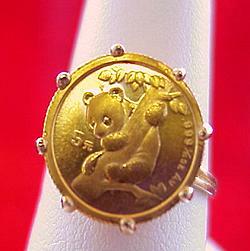 .999 Gold Chinese Panda Bear Ring...Each coin comes to you in perfect gem brilliant uncirculated condition and custom mounted in our solid 14k gold ring. 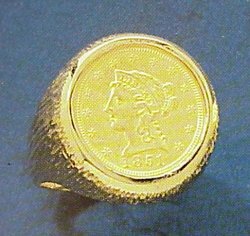 Each is made using a genuine U.S. $2-1/2 Liberty Head gold coin minted from 1849 - 1907 and selected for its premium quality and comes mounted in our custom ring made of solid 14kt gold and ready to wear! (call for date availability)! Beautiful 1/10 oz. American Gold Eagle coin bracelet...This popular seller will come to you mounted in our popular 14k yellow gold rope chain bracelet! Not finding what you are looking for? Be sure to visit Diamondshere.com for more pendant selections!...Diamondshere Jewelry Dept. for more terrific fine jewelry pendants. 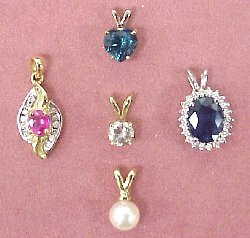 We have a large selection of diamond, pearl, ruby, and sapphire pendants.